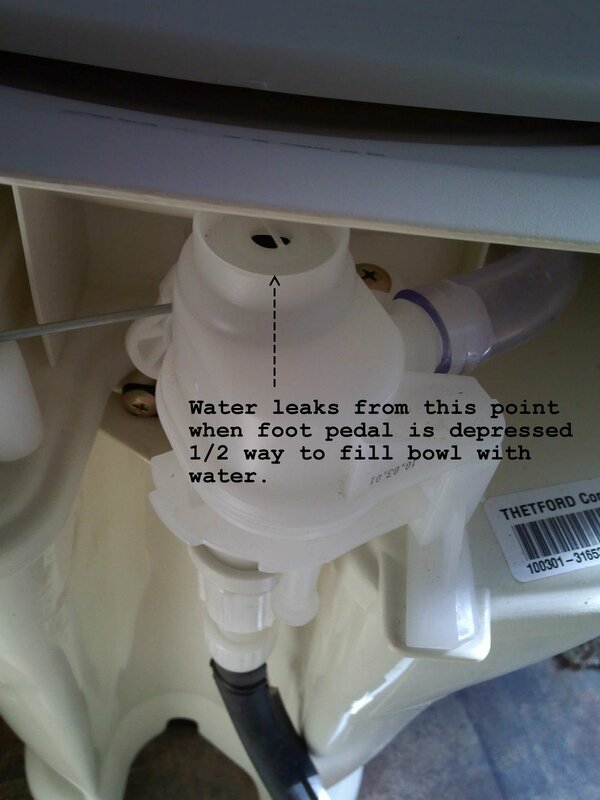 During our first trip with our 2010 Keystone Premier 31BHPR, one issue that came up was a leak from the RV toilet. After investigating a little closer, I discovered that clean water was coming out of the top of the valve in the rear when the foot pedal was lifted up to fill the bowl with water. You can see in the picture, where the water was coming out. When I dropped the RV off at our dealership to look after some other warranty items, they could not replicate the leak. So I called Thetford's 1-800 number today, gave them the serial number on the Aqua Magic V toilet as well as the VIN number on our Keystone and they told me they would send the part out to me right away. Now, that's great customer service. Since we'll be on the road for 3 weeks, if the leak develops while we are away, I'll be able to replace the part myself.